Luke helps overthrown an evil tyrant on a world of lizard people. Tasked by Princess Leia with helping overthrow a cruel, Imperial-friendly ruler on the planet Serphidi, Luke and two other pilots, Berl & Cinda, are attacked by a group of TIE Fighters as they near the planet. They manage to destroy the TIE's, but Cinda's X-wing is damaged, and crashes near a hunting party led by the evil king S'Shah. In the ensuing fight, Berl is killed and Cinda captured, but Luke manages to escape and save the life of Elglih, an older Serphidian who is hoping to overthrow S'Shah at the upcoming jousting tournament. Luke agrees to fight in Elglih's stead. 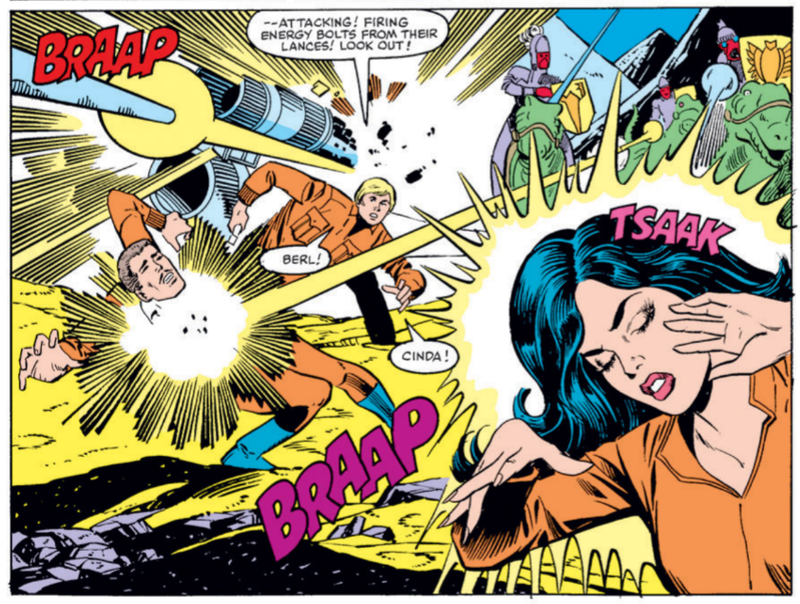 As the tournament approaches, Cinda is prepared to serve as the main course at S'Shah's victory feast, but during the joust, Luke manages to unseat S'Shah, and is then forced to kill him when he draws a concealed weapon. Having won the contest and the right to rule the planet, Luke frees Cinda and names Elglih the new king, who agrees to maintain a strong bond with the Rebel Alliance. As Luke & Cinda return to their base, they express sorrow at the loss of Berl, though Luke says he would be happy knowing he died helping, in some small way, to restore freedom to the galaxy. Though Michelinie receives a scripting credit, this is very much a self-contained fill-in issue, with a plot credited to Michael Fleisher and art from Joe Brozowski; I recognize Fleisher's name from the 70s era Superman, Batman and Wonder Woman encyclopedias that were reprinted a few years ago, but Brozowski isn't a name I've encountered before. 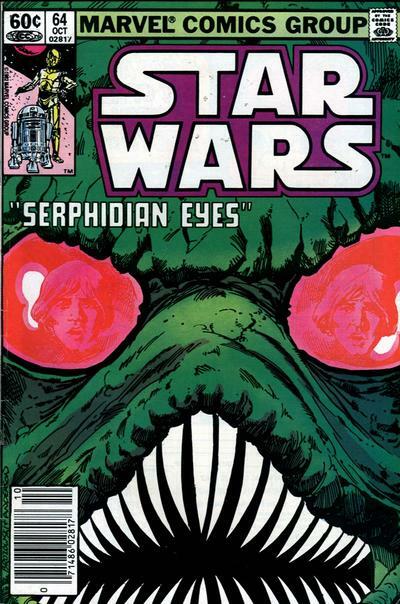 This issue introduces a bunch of one-off stuff that never really shows up anywhere else, including the lizard-like Serps of the planet Serphidi and a couple characters there on, along with a pair of Rebel pilots, Berl (who dies on Serphidi) and Cinda Tarheel, who gets captured and almost eaten by the evil Serphidi king before leaving the planet with Luke. Of mild note, Cinda Tarheel was later retconned by a reference book into being present at the Battle of Hoth in Empire Strikes Back, serving as one of the gunner aboard a snowspeeder as part of Luke's Rogue group. 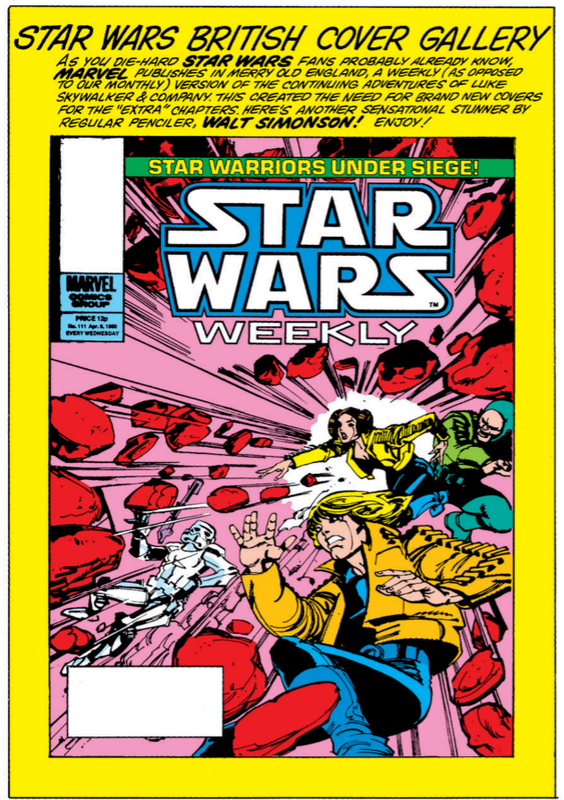 One of the original Marvel UK covers is reprinted in this issue. Apparently, Threepio and Artoo receive annual parts maintenance. 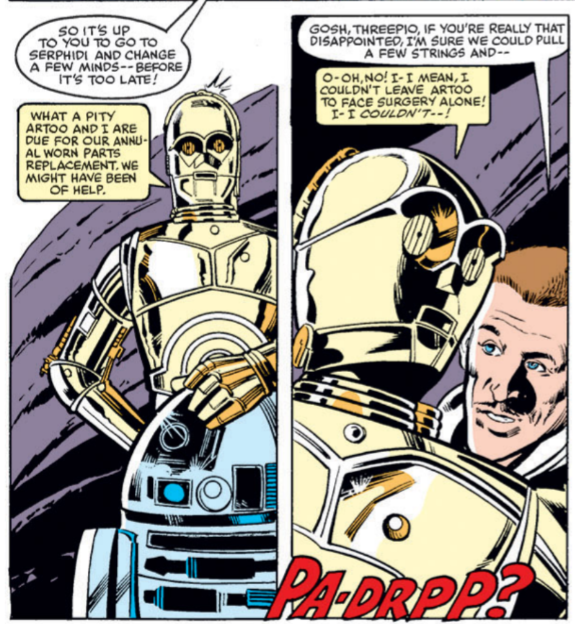 Echoing one of Yoda's more famous dictums (now if not when this was published), Luke declares he won't try, he do. The art throughout this issue is wonky, at best. But this panel stuck out as being particularly egregious, with some weird anatomy from Berl & Luke and Cinda looking like she's dancing and/or casting a spell. A pretty standard fill-in, in terms of plot: one isolated character (Leia and the droids appear briefly, but this is Luke's story) dropped into a basic SF premise (here, the alien world that has gone all-in on a specific piece of Earth culture, given a sci-fi twist, ie medieval jousting done with lances that shoot lasers wielded by lizard people) with a vague thematic connection to the series (Luke helping overthrow this tyrannical regime is just like what he's trying to do to the Empire in microcosm!). This particular fill-in falters relative to others of its kind in two ways. One is its timing, coming as it does in the middle of a plotline that found Luke functionally exiled from the Rebels; here, he's back to leading a mission without comment (or even a "this takes place before issue X" footnote). The other is the art, which is generally stiff, sloppy in some places, ugly in others, and occasionally hard to follow. All together, an unexciting, mostly forgettable, fill-in. 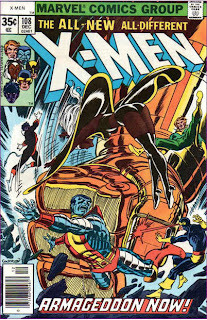 Every time I see this cover I immediately think of Uncanny #232. 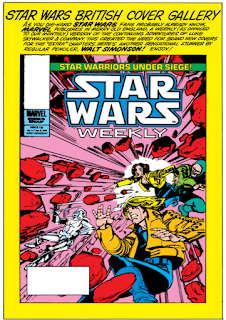 Something tells me Mark Silvestri might've taken some inspiration from this issue. 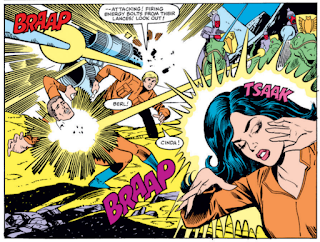 A large part of the blame almost surely goes to the infamous Vince Colletta. That one panel you called out, which hurt my soul just a bit, shows both his frequently cavalier attitude towards the end result (never more painful than in his work over Kirby, perhaps) in terms of the fellas and on Cinda the surprisingly fine touch he could bring to his many, many romance-comics assignments even if the women all ended up looking the same. It’s entirely possible that this was a rush job, though, as he was known to accept jobs on deadlines that nobody else would even if the pages were only finished in the most literal of senses. Joe Brozowski had a fairly long stint on Firestorm in the ’80s, sometimes as J.J. Birch, but I haven’t seen much from him (either of that or otherwise). Michael Fleisher is best known, apart from (or maybe including) those encyclopedias, his gonzo Spectre run in Adventure Comics drawn by Jim Aparo in the early ’70s and over a dozen years writing Jonah Hex from the Wild West to the post-apocalyptic future.